Cervical Facet Syndrome occurs when the joints of the neck become inflamed and pain develops. It is associated with aging and joint degeneration. The pain occurs when the facet joint has lost the ability to glide and move smoothly. 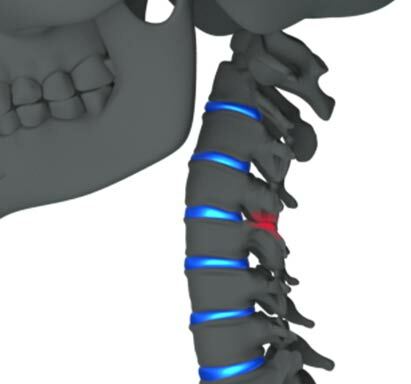 The facet joints are located between the disc and the body of the vertebra in front and the spinous process or the bumps you feel on the back of the neck. The joints glide when the neck is rotated, flexed or extended. Cervical facet syndrome is caused by the cervical spine disc degenerative cascade. As the disc narrows, the facet joints are required to carry more physical load, and the joints move in a different manner. In some cases, “whiplash” injury or other similar sudden back and forth rapid unguarded movements to the neck can cause these facet joints to become symptomatic. A strain to the facet joint capsular ligaments can create inflammation, which may result in neck pain, shoulder pain and trapezius tenderness. There is generally a decrease in range of motion in the neck. Patients often have more pain and stiffness in the morning or after they have been in one position for an extended period of time. Movement generally improves symptoms. Fortunately, Cervical Facet Syndrome is self limiting, but some medical interventions can accelerate the return to the normal baseline.